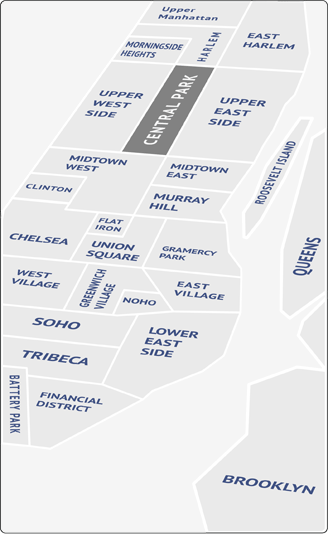 NoHo, for North of Houston Street is a neighborhood roughly bounded by Houston Street on the south, The Bowery on the east, Astor Place on the north, and Broadway on the west. It is a vibrant and historic district that offers a diversity of commercial, educational, artistic, cultural, and social institutions. Two of the most renowned departments of NYC, the Gallatin School of Individualized Study and the Tisch School of The Arts, are both located on Broadway in NoHo. Primarily made up of loft apartments, which in turn makes it one of the most expensive and desirable neighborhoods in Manhattan. In addition to each season of full-scale theatrical productions, The Joseph Papp Public Theatre produces a number of different series, festivals and programs each year. There is the Angelika Film Center & Café, as well as many off Broadway theatres. In August, NoHo is involved in Summer Streets where city streets are turned into pedestrian walkways, and the annual NoHo Art Walk showcases emerging artists and the many wonderful art galleries in the neighborhood. Take a walk to over to SoHo or Greenwich Village or go east through St. Mark’s Place to Tompkins Square Park with its playgrounds and basketball courts, dog run, ping pong table, handball courts and built-in outdoor chess tables.